Fans of the Japanese science fiction/fantasy genre around the globe celebrated the “King of the Monsters” 40th anniversary on November 3rd, 1994, for it was on that date in 1954 that Toho Studios unleashed Godzilla on an unsuspecting public. However, one could argue that the true date of Godzilla’s birth was not November 3rd, 1954, but August 6th, 1945, the day the United States dropped the atomic bomb on Hiroshima. At the end of the war Japan was devastated, physically, politically and financially, and although the Japanese reaction to this defeat is evident in their present anti-nuclear policies, their feelings have never been fully understood. But perhaps a partial understanding can be achieved by looking into two important Japanese films released in 1954 and 1955, Gojira, and Gojira no Gyakushu3. Japans post war industries made one of the most remarkable recoveries in the history of the modern world. One of their most vital was their film industry, which started back in 1896 when the first Edison Kinetoscopes were imported into the country. In 1912 the Japan Cinematography Company was founded, and by 1932 a man named Yasuji Uemura founded Shashin Kagaku Kenkyu-jo (Photo Chemical Laboratories), which produced Japan’s first musical Intoxicated Life (1933), directed by Sotoji Kimura and sponsored by the Dai-Nippon Beer Company (thus a film to drunkenness). P.C.L’s success at musicals attracted the attention of Japanese railroad magnate Ichizo Kobayashi, who in 1935 absorbed P.C.L into his own expanding entertainment empire. In 1936, after having acquired J.O. Studios and Osaka Mainichi Talkie Newsreels, Kobayashi united the three film companies into one distribution company, Toho, which was the abbreviation for Tokyo Takarazuka. Then in 1937 the Japanese Imperial Army invaded China, and Japanese films became an extension of Japan’s fascist propaganda unit, the Office of Public Information. Now Toho company’s facilities would be employed to produce such propagandistic smash hits as The War At Sea from Hawaii to Malay (1942). The company’s facility with the war genre was thanks in large part to the efforts of Iwao Mori, who was instrumental in developing the studio’s visual effects department. Upon Japan’s defeat, and the following American occupation, Mori was exiled from the industry by the U.S. Army’s Civil Censorship Division (SCAP), due to his involvement in Toho’s war propaganda films. But in 1950, plagued by strike and tax difficulties, Toho was tottering on its last legs. Something had to be done, and that something would be the rehiring of Mori. Mori was once again a chief executive at the company, and had almost single handly reverse the company’s postwar fortunes entirely. In March of 1954, Japan suffered from another nuclear disaster, though far smaller in scale than the 1954 bombings. Tuna caught off the coast of Japan were found to carry high levels of radioactivity after a fishing ship, the Fukuryu Maru (Lucky Dragon), accidentally sailed into an American test site, contaminating the entire crew. One crew member eventually died of what was reported as radiation poisoning and the Japanese press pointed the finger towards American irresponsibility. The debate centered on whether the ship’s crew was at fault or whether the radius affected by the test far exceeded the estimated range and had in fact caught the ship. The incident was dubbed “The Second Atomic Bombing of Mankind” by the Japanese press. It was this situation which inspired the Toho Company to make its first movie monster a radiation-mutated sea creature terrorizing mankind, and planted the seed in Tanaka’s mind on how to replace In The Shadow of Glory. Tanaka had impressed Mori with his idea to replace In The Shadow of Glory with his idea about “a monster that invades Tokyo the way King Kong attacked New York,” and without Mori’s support it is doubtful that the project would have ever have gotten off the ground. With Mori’s support, the task of accomplishing this was assigned to Ishiro Honda and Eiji Tsuburaya. Eiji Tsuburaya was a veteran cinematographer Mori knew was the expert who could produce extravagant films. Few technicians in the field of visual effects have ever achieved his notoriety or respect. Tsuburaya’s particular knowledge of special techniques far outstripped that of any of his contemporaries. Mori knew that, and chose Tsuburaya to head Japan’s film industry’s first special effects department. “I was the only one in the department,” Tsuburaya wrote. “That was pretty weird.” Tsuburaya would work, usually alongside director Kajiro Yamamoto, on highly ambitious war pictures. His special effects being of such high quality that following the war, the American Occupation forces frequently mistook the surviving fictional films for Japanese produced newsreel footage. Unfortunately, like Mori, Tsuburaya would also be exiled from the industry by the SCAP. When the occupation lifted Tsuburaya was invited back to Toho, where he and Mori took up where they had left off, with the first Japanese war picture in eight years, Eagle of the Pacific, which was directed by Ishiro Honda. Also as important to Honda were Japan’s attitudes and fears of the early 1950s. The Second World War was less than ten years ended and the Japanese were still laboring under the consequences of their failure and defeat. America had influenced the rebuilding and restructuring of Japan, affecting everything from industry to the political structure. Around Japan the Cold War expanded and nuclear test took place, adding to Japan’s fears for its people, country, and for the world. 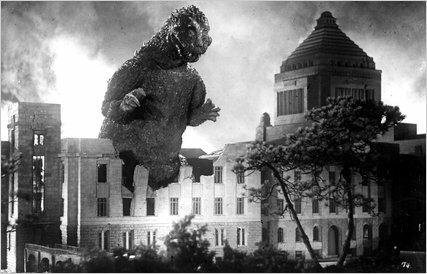 The shaky post-war situation and the “heating up” of the Cold War, combined with certain specific incidents in the early 1950s, that set the stage for Gojira. With special effects master Eiji Tsuburaya, and producer Tomoyuki Tanaka, Honda accomplished a feat unequaled at the time. In the guise of a typical Hollywood style monster movie, they made Japan, and ultimately the world, experience the bombings of Hiroshima and Nagasaki all over again. To this, the task of designing and constructing the main costume went to Ryosaku Takayama. The result was one of the most inspired creations in film history, combining the appearance of a therapod dinosaur with the distinctive oriental look of a dragon. But it was not only the monster, but the story behind Gojira which set the production apart. The conflict quickly escalates as a fishing village on the small island of Ohto is attacked, the horrors of war having hit home on the innocent is portrayed as the faceless enemy destroys the village. Takashi Shimura, a regular member of Akira Kurosawa’s stable of actors and star of Kurosawa’s Ikuru (1952), and Seven Sameri (1954), is introduced and gives a great performance as Dr. Kyohei Yamane, Japan’s leading paleontologist. It is while this disaster is being investigated by Yamane that the face of the enemy is finally revealed. 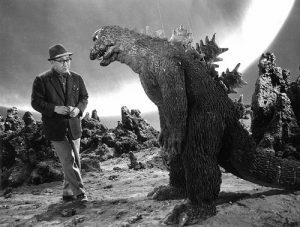 Assisted by his daughter Emiko (played by Momoko Kochi), and her fiancee Hideto Ogata (played by Akira Takarada), the three stumble upon Godzilla’s hulking bulk peering over the mountain tops. Although a product of atomic testing, Godzilla’s symbolization of the atomic bomb is not yet evident. Mirroring Japan’s failure to surrender immediately after the Hiroshima bombing, the threat of Godzilla still exists. However Dr. Serizawa is reluctant to use the Oxygen Destroyer, and when Emiko, the only person entrusted with his secret, informs Ogata of the weapon, the two visit the doctor to confront him. This confrontation between Serizawa, Emiko and Ogata near the end of the film, even after the destruction brought by Godzilla fails to convince Serizawa, clearly represents Honda’s questioning whether the atomic bomb should have ever been used. Although Honda had served during the war, he was opposed to all forms of military operation16. It is only after the sight of Japan’s youth praying for peace is broadcast (indicating the nation’s weariness of war), that Serizawa is finally moved to use the Oxygen Destroyer, but not before burning all of his notes and diagrams, insuring that no trace of the weapons construction can be reproduced. However, in Serizawa’s mind that is not enough, and as the Oxygen Destroyer is set off in Tokyo Bay directly in front of Godzilla, and as Ogata is pulled towards the surface, Serizawa cuts his own life line, telling Ogata, “Be happy together,” his last words. Serizawa’s sacrifice at the end of the film not only illustrates the loyalty and self-sacrifice of the Japanese people (for he knows Emiko is in love with Ogata, not him), but it also demonstrates Serizawa’s willingness to ensure that not only is Godzilla destroyed, but that the Oxygen Destroyer, a weapon “more horrible than Godzilla” (the H-bomb?) is never used again17. As Gojira is to the bombing of Hiroshima, then Gojira no Gyakushu (1955), is to the bombing of Nagasaki. Although technically inferior compared to the first film, as this time Honda was not in the director’s seat, the second film in the Godzilla series explores the reaction of the Japanese public both during and after the time of war. While sequels were as commonplace in Japan as in Hollywood, the success of Gojira took everyone at Toho, especially Tomoyuki Tanaka by surprise, and plans were quickly made to rush a sequel into production. This time Takeo Murata and Shigeaki Hidaka were to pen the script and the special effects were once again supervised by Eiji Tsuburaya. 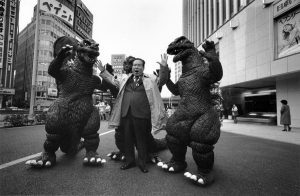 Motoyoshi Oda was given the task to direct, as Ishiro Honda was committed to the company’s Jujin Yukiotoko (Half Human) film project, although Honda was involved briefly in developing the Godzilla sequel. Mere months after the release of the original film, on April 24th, 1955, Gojira no Gyakushu burst upon the Japanese public. Concerned over what happened to Tokyo the year before, the military calls in Dr. Yamane (Takashi Shimura reprising his role form Gojira), who informs the officials of Osaka that there is no way to stop this new Godzilla, especially as the plans for the Oxygen Destroyer perished with Dr. Serizawa. Japan is once again at war, only unlike the first film, this time the film follows more closely the effects the threat that Godzilla (i.e. war), has on the personal lives of the main characters. The first half of the film represents Japan’s war preparations, and how the threat of war impacts on the lives of the Japanese people. However, unlike the first film, where the bombing of Hiroshima (in fact the destruction of all Japan), is represented by Godzilla’s attack on Tokyo at the end of the film, the bombing of Nagasaki is represented by the battle between Godzilla and Angilas in Osaka, about halfway into the film. And now the characters are left to pick up the pieces again. In fact the focus of this film is much more on the aftermath of the “bombing,” so much so that Godzilla is not even shown being driven out or leaving Osaka after killing Angilas. Instead, Oda uses a scene of Hidemi, simply watching the burning ruins of the city from the window of her family’s faraway country house. The dead silence of the land and the night contrast eerily with the unearthly light hovering over the beleaguered city. The focus now is on the Japanese principle and work ethic to pull together and start rebuilding, instead of focusing on the dead and dieing. The “war is over,” and it is time to rebuild. We are shown scenes of total destruction, but also see workers toiling to clean out and rebuild Osaka where the characters all work for their living. This is just as it was when the Japanese accomplished the most speedy and thorough economic recovery of the century. These scenes are especially moving and add a sense of realism to the story. Certainly, Japan’s kaiju-smashed cities are rebuilt over and over, but this is the first and only film to show the reconstruction. Godzilla is all but forgotten. The film also conveys the sense that life goes on, as Kobayashi and the rest of the Kyo Canning Company are relocated to the company’s Hokkaido branch to continue work. Hokkaido, the northern island of Japan, is pictured as a winter wonderland, with the workers enjoying themselves and the threat of war long since past. The mood is so happy and serene that Bing Crosby singing White Christmas would not seem out of place. The arrival of the company executives, including Tsukioka, Hidemi, and her father, illustrates the joy of life returning to normal. The fishing fleet is out, the executives are enjoying themselves and Tsukioka and his Air Force buddies are reunited and trading war stories. Then disaster strikes; Godzilla destroys the fishing fleet, and the threat of war again looms over Japan. “Just as the Cold War had followed the Second World War, and just as the specter of worldwide nuclear destruction had haunted the world in the wake of Hiroshima and Nagasaki, Godzilla remains a force to be reckoned with20.” However, unlike the first film, Godzilla is no longer a threat to Japan and he becomes the hunted instead of the hunter. Military forces track Godzilla and he is eventually trapped on Shinko Island, representing Japan’s determination to never again suffer the horrors of atomic devastation. This determination is never more evident than at the end of the film, when it is revealed that Kobayashi is in love with Hidemi. Her betrothal to Tsukioka sets up another love triangle as in Gojira, but this triangle is never given the chance to develop. As naval forces approach the island with the intention to destroy Godzilla, Kobayashi sacrifices himself, kamikaze style, in an attempt to keep Godzilla from leaving the island until the military arrives. This again marks one of the rare times that a main character and hero of a Godzilla film dies21. Witnessing his friend’s sacrifice, and seeing the effects the falling ice has on Godzilla, Tsukioka convinces the military forces to bomb the mountain side, causing an avalanche, and burying Godzilla under tons of ice for all time22. It is the combination of many unique symbolic and narrative aspects that make Gojira and Gojira no Gyakushu the best films in the Godzilla series. It is unfortunate that the American versions of these films lose some of their impact when compared with the Japanese originals, but if looked at them objectively the intended premises can still be found.